There are of course many hotels right next to the beach on in the larger Lamai and Maret area, but there are also many other choices in other parts of the island, and how with the Ring Road going around the island it is quite practical to stay in another resort area but still use the facilities of Lamai Beach. Imperial Boat House Resort - Situated on the north east part of the island at Choeng Mon Beach this is a very wood and tradition themed resort. The hotel suites are actually authentic teak rice barges that have been converted into luxury accommodation. Around the landscaped gardens are another 100 or so rooms in traditional style, as well as two pools and plenty of facilities for both family vacations and business conferences. Iyara Beach Hotel & Plaza - Situated in Chaweng this small hotel (pictured) with only 75 rooms of various sizes is right on the beach and provides a perfect get away destination. With a circular pool just by the beach and encircled by palm trees under which sun loungers allow you to laze the day away. On the beach tables and chairs let you sit comfortably and enjoy the sand between your toes while dining on our fine Thai and international cuisine. Combined with the shopping plaza offering name brands as well as local shops this is a reasonably priced place to stay. Hansar Samui Resort - On the northern coast at Bophut this is very close to the airport but also on the beach, so a great convenient location. Also very close to the Fisherman's Village which is one of the old traditional parts of the island. 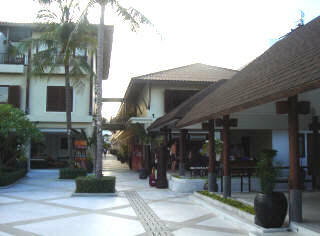 The resort itself is a modern building but low rise and decorated with timber and fabric in traditional style giving the feeling of old Thailand, but with the facilities of a modern hotel. Chaweng Regent Beach Resort - Just up the coast at Chaweng this beach resort is as close to the sea as it is possible to get, with only a few steps from the pool to the beach. Banyan Tree Samui - One of the major Thai brands of hotels the Banyan Tree in Koh Samui is a luxury resort very much for adults, with relaxing spas and separate private cottages it is the perfect get away for a couple. Amari Palm Reef Samui - This quiet resort hotel on Chaweng beach is popular with an international crowd. The perfect place for a wedding or anniversary get away it features a spa, multiple shaped pools intertwining the modern yet traditional buildings, and great places to eat. All set on a clean white sand beach with a nearby reef perfect for diving expeditions for the beginner diver.